Dr. Louisa Martin is originally from Scotland and grew up traveling all over the world with her family. She graduated with an Honors degree in Zoology from the University of Wales and then obtained a degree in Veterinary Medicine from the Royal Veterinary College in London. Prior to becoming a vet, Dr. Louisa worked as a zookeeper at wildlife rescue centers in Thailand. She also helped with animal rescue during and after Hurricane Katrina in New Orleans. She has been practicing in the USA for the last 11 years working mainly with dogs, cats and exotic pets. She has a real love for veterinary medicine and is very appreciative of the trust our clients give us with the care of their precious pets. 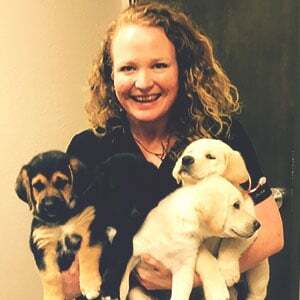 Her philosophy in practicing veterinary medicine is to work hand in hand with pet owners to provide the best, most complete care possible for their pets. In December of 2012, Dr. Louisa and her husband, Des, purchased Boat Club Road Animal Hospital and fulfilled her dream of owning a veterinary hospital. They have 2 beautiful daughters, Charlotte and Ivy. Their family is rounded out with two dogs, Wolfie and Odie, and three cats, Brian, Malcolm and Nibbles.